Kerouac's book On the Road can be easily considered the Bible of the Beat Generation. It depicts a rebellious lifestyle that was in sharp contrast to that lived by most people of the era. It contains the seed of the later hippie movement and was marked by some of the following characteristics: a spontaneous outburst of existence underlined by a spiritual longing with a burning, almost corrosive desire for life. It was less about finding reasons for the what of living, but rather looking for the how, different ways and manners of living life to the fullest. Their philosophy was fueled by the careless and excessive use of booze and drugs, some ideas of Zen Buddhism, and the improvisatory nature of jazz music. In fact, jazz can be used as a fitting metaphor here. Not only is the style of Kerouac's influential novel inspired by jazz, but so is the daily life of one of their prototypes and heroes of the movement: Dean Moriarty (also known as the real life person of Neal Cassady). Jazz music is known to be based on the mood of the moment. It is, just like Zen, aiming for and existing firmly in the present, and like our daily experience it is unique, fleeting and changing from moment to moment. This is the life proposed or lived according to the Beat Generation, a life that is based on the probing satisfaction and enjoyment of the here and now with worries and questions about the future kept at bay. Although it may sound interesting and inspiring in theory, it is a complete mess and disaster when applied to real life. Although many may hail the character of Dean Moriarty as a hero, a revolutionary of the oppressive status quo, I see him as a petty criminal and irresponsible fool who goes through life like a hyperactive child. The problem lies in what we may define as identity here. What does it mean to be yourself? Are we really our feelings, the moment to moment states? Are we our desires? Is life about the gratification of those budding and bubbling emotions that surface within our consciousness, the incessant neuron firing squad? If your answer is yes to those questions, you may be inspired by such a lifestyle that is so deeply rooted in the here and now that the future never exists. That may be good when you are young and single and for a limited and designated time, but not when you have a family to care for (in Dean's case a trio of wives and various kids along the way). Apparently the real life inspiration Neal Cassady in his later years told his son not to follow in his footsteps. This kind of lifestyle is also like a foot that pushes the gas pedal glued to the floor. What happens is that the speedometer will break and you have no idea of how fast you are going. And the end effect will be that unrecognizable piece of steel junk that the once beautiful Cadillac has been reduced to in the novel. In other words, you cannot live a whole life like that. And if you do, you end up dying prematurely like poor Neal and its very same author Jack Kerouac. It is a sad finish to a life that simply knew or accepted no limits. In fact, they seem to have overlooked one of my favorite maxims in Buddhist philosophy, the fact that one ought to live life in moderation. I am far from denouncing drug or alcohol use nor am I saying that one ought to live a chaste life. But what I strongly believe is that the sky is not the limit when it comes to living life of sensual pleasure and gratification; one should know when to go and when to stop. It is all right to rebel against unjust ideas or to live life according to who you are but, whether we like it or not, life comes with plates of responsibility. First and foremost, we are responsible toward ourselves. Identity has different layers; it is best to respond to the most profound level of our being. For example, part of me may want to let loose and get drunk or high to the point of no return. This may be acceptable as a once-in-a-blue-moon type of releasing steam, but I highly doubt it to be a good strategy for one's daily existence. There is hardly anything spiritual about it, rather it seems that one is simply adopting the view of an eternal teenager. Just acting upon your feelings of pleasure is not going to get you very far in life and is not rewarding to the spirit. In the case of Dean's restlessness, we see that he never feels comfortable nor at home no matter where he finds himself. 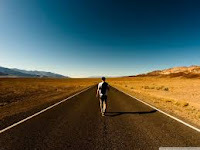 He always keeps pushing, moving and looking for something new, be it a new place, a new experience, a new girl. His life is based upon surfaces instead of depth; had he chosen to stay with one place and person and explore each in depth would have brought a more lasting and spiritually satisfying connection than changing all of those more often than one changes one's shirt. A better way would be mindfulness. Most of our feelings are the surface waves, while the pearl is still hidden in the bottoms of the dark and profound ocean. It is through patience and watching one's feelings that one can dig deeper into one's personality and get to what one – or one's higher Self - really wants. In such a view, one may disregard physical pleasures and instead turn to the deeper spiritual joy one gets by going to the park with one's family, by reading a book (like One the Road) or by watching the sunset. Speaking of joy, I believe none of them experienced it in a profound way. They lived on shooting-star bliss and just like drugs the effects would be overwhelming for a moment and then would vanish into thin air. Hence they would attempt to repeat it again so that they can feel pulsating life again and not become numb to the world. Daily routine life is seen as losing steam on the passion for life, but it does not have to be so. The word “beat” is an interesting and ambivalent word choice indeed. At times, in its happier moments it signifies “beatific,” to bathe oneself with the glow of the endless and holy beauty of the world. Yet most of the time, it means “beat” in the sense of downtrodden like a car that hardly goes. There is a profound despair mixed with insufferable sadness for these Beating poets who are fatherless and rootless and are on the road through vast and equally desolate lands. I endorse your remarks, Arash. I read the book in my student days, in 1961; and found it inspiring. Then last year I watched the film; and found the characters pathetic and in many ways criminal and despicable. They treated their womenfolk very badly. Thanks, Vincent! I have just recently read the book and especially after watching the quite faithful (perhaps even more faithful than the actual book!) film version, I felt rather let down with the characters, especially Dean. I can't believe he left his sick friend alone in a strange country! And yes, they treated their women horribly, simply as objects of their satisfaction. But what I enjoyed most about the book was its style and candor not so much its content.